It is that time of year again. It’s pumpkin spice latte time! 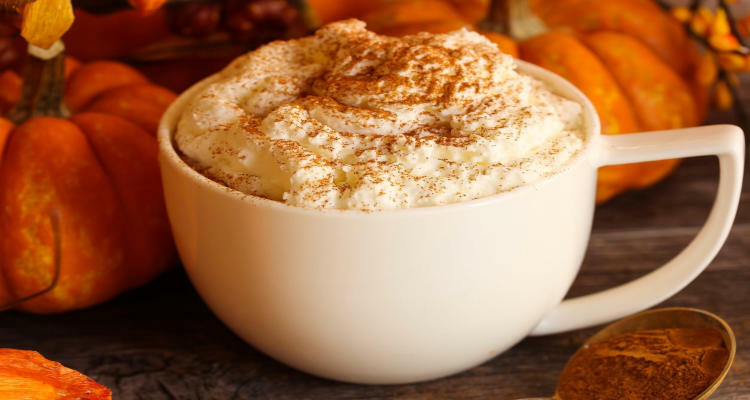 A pumpkin spice latte is a festive dessert coffee made with traditional fall spice flavors, such as clove, nutmeg, and cinnamon, along with pumpkin puree, espresso, steamed milk, and sugar, and topped with pumpkin pie spice and whipped cream. The original pumpkin spice latte from Starbucks was introduced 15 years ago, and since then, other coffee and fast-food chains have created similar pumpkin spice latte products, including Dunkin’ Donuts and McDonald’s. This article is your guide to everything pumpkin spice latte. We will detail everything about the taste, ingredients, and pumpkin spice latte nutrition, including how many calories are in this coffee drink. We will also compare the branded pumpkin spice latte with a homemade pumpkin spice latte. What Does a Pumpkin Spice Latte Taste Like? It depends on the type of pumpkin spice latte. For instance, many find that a Starbucks pumpkin spice latte tastes quite sweet and even artificial, as chemicals are used to mimic the taste of freshly baked pumpkin pie. A homemade pumpkin spice latte will taste even more like pumpkin pie, with pumpkin puree and coconut milk. What Ingredients Are Used in Pumpkin Spice Latte? While the homemade pumpkin spice latte ingredients list will be far simpler, with coffee or espresso, vanilla extract, pumpkin pie spice, maple syrup, pumpkin puree, and milk or coconut milk. What are the pumpkin spice latte nutrition facts? The nutrition will depend on the type of pumpkin spice latte being consumed. A 16-oz. Starbucks pumpkin spice latte with 2% milk and topped with whipped cream contains 380 calories, 13 g of fat, 8 g of saturated fat, 50 g of sugar, 52 g of carbs, and 14 g of protein. A 12-oz. pumpkin spice latte with 2% milk and topped with whipped cream contains 300 calories, 11 g of fat, 7 g of saturated fat, 11 g of protein, 40 g of carbs, and 39 g of sugar. A 16-oz. pumpkin spice latte with non-fat milk and no whipped cream contains 260 calories, 0 g of fat, 51 g of carbs, 14 g of protein, and 49 g of sugar. A 12-oz. pumpkin spice latte with non-fat milk and no whipped cream contains 200 calories, 0 g of fat, 39 g of carbs, 38 g of sugar, and 11 g of protein. A 16-oz. pumpkin spice latte with coconut milk and no whipped cream contains 260 calories, 7 g of saturated fat, 46 g of carbs, 4 g of protein, and 44 g of sugar. A 12-oz. pumpkin spice latte with coconut milk and no whipped cream contains 200 calories, 6 g of saturated fat, 35 g of carbs, 3 g of protein, and 33 g of sugar. What about a pumpkin spice soy latte? A 16-oz. pumpkin soy latte with whipped cream contains 380 calories, 12 g of fat, 5 g of saturated fat, 57 g of carbs, 1 g of fiber, 51 g of sugar, and 12 g of protein. A 12-oz. cup of pumpkin soy latte with whipped cream contains 300 calories, 10 g of fat, 4.5 g of saturated fat, 43 g of carbs, 1 g of fiber, 39 g of sugar, and 9 g of protein. Each drink also contains some vitamin A, iron, calcium, and other nutrients. A mug of homemade pumpkin spice latte with coconut milk, organic pumpkin puree, maple syrup, pumpkin pie spice, vanilla extract, and organic brewed coffee or espresso contains 247 calories, 21 g of fat, 0.5 g of fiber, 1.8 g of protein, 11.2 g of carbs, 8.5 g of sugar, 35% of your daily value of vitamin A, and small amounts of iron (0.7 mg), calcium (20 mg), and potassium (192 mg). How Many Calories Are in a Pumpkin Spice Latte? What’s the lowdown on pumpkin spice latte calories? The calorie content will depend on the type of pumpkin spice latte and the size of each cup. The addition of whipped cream will increase the calorie content of the pumpkin spice latte as well. Here’s a brief look at the calories in pumpkin spice latte with 2% milk and with and without whipped cream. A 20-oz. pumpkin spice latte with 2% milk and whipped cream includes 470 calories, while the same drink at 16 oz. contains 380 calories. A 12-oz. drink contains 300 calories and an 8-oz. drink contains 210 calories. A 20-oz. pumpkin spice latte with 2% milk and no whipped creams includes 400 calories, while the same drink at 16 oz. contains 310 calories, 240 calories at 12 oz, and 160 calories at 8 oz. Does the Pumpkin Spice Latte Have Caffeine? Coffee or espresso is the main ingredient in a pumpkin spice latte. As a result, a pumpkin spice latte most definitely includes caffeine. The Starbucks pumpkin spice latte caffeine content for the house blend is 150 mg in both Grande (16 oz.) and Venti (20 oz.) cup sizes. Other blends of pumpkin spice latte may contain more caffeine. For instance, Starbucks’ special Pike Place roast contains 310 mg of caffeine. In general, pumpkin spice latte doesn’t contain as much caffeine as a regular dark roast coffee from Starbucks. For instance, a 16-oz. dark roast coffee contains 250 calories, whereas there are only 150 mg in a pumpkin spice latte of the same size. If you’re feeling tired in the morning, a pumpkin spice latte might be a good idea. However, avoid a pumpkin spice latte late at night unless you want to be kept up at night. An introduction to some of the different varieties of pumpkin spice latte, and how to make them, is in order. The following are recipes for a homemade pumpkin spice latte, a pumpkin spice latte with syrup, an iced pumpkin spice latte, and a low-calorie pumpkin spice latte. This is one version of a homemade pumpkin spice latte. You can make it in a number of different ways, including with dairy or non-dairy milk, coffee or espresso, or maple syrup or sugar. The choice is up to you. In a small saucepan over medium heat, whisk pumpkin pie spice, syrup, pumpkin puree, milk, and vanilla extract. Cook and whisk constantly until the mixture begins to steam. Remove from the heat and pour the mixture into a blender. Hold the lid on tightly and blend for 15 seconds, or until it becomes frothy. Make the coffee or espresso. If you like extra milk foam on the top of your latte, pour a few tablespoons of milk into a glass jar with a lid when the coffee is brewing. Seal the lid and shake for 30 seconds to a minute, and place in a small pot and heat on medium until it becomes foamy. Top the coffee mixture with extra foam and sprinkle on some pumpkin pie spice. Alternatively, serve with whipped cream. This next recipe is a pumpkin spice latte with syrup. This recipe serves two people, and is perfect for Thanksgiving brunch. The syrup for this recipe will last one month in the refrigerator, and will store unrefrigerated for about a week. It will make about one and a half cups of syrup. Combine pumpkin pie spice and pumpkin puree in a small pot over medium heat and cook until it thickens and the spices become fragrant, for about three minutes. Combine two cups of cold water and the granulated sugar and brown sugar in a medium pot, and bring it to a boil over high heat. Cook and whisk occasionally until the mixture thickens and it reduces. This will take about five minutes. Reduce the heat to low, whisk in the spiced pumpkin puree, and cook occasionally for 10 minutes. Make sure the mixture does not boil after you add the pumpkin, or the syrup will become cloudy. Remove from heat, and let it cool for about 10 minutes. Place a mesh strainer over a medium bowl, and line the strainer with layers of cheesecloth. Pour the mixture through the strainer, and let it slowly strain into the bowl. Add vanilla extract to the syrup, and transfer to a container. Bring the milk to a simmer over low heat, and froth the milk with a whisk or milk frother. Combine the espresso shots and a tablespoon of pumpkin spice syrup in two large coffee mugs, and stir half of the milk into each mug. Sprinkle spice on top of the pumpkin spice latte. You can also put your latte on ice and create an iced pumpkin spice latte. The iced drink is refreshing for a warm day, or anytime you prefer a cold drink. Combine half and half cream or milk, cold brew coffee or espresso, vanilla extract, pumpkin spice, and sugar to a high-speed blender. Blend on high until the liquid becomes somewhat frothy or foamy. Pour in a glass of ice, and top with whipped cream and more pumpkin spice for a garnish. Serve and enjoy! What is a low-calorie pumpkin spice latte? You will save calories in a pumpkin spice latte when you replace the milk or cream with non-fat milk or non-dairy milk like coconut milk or almond milk. Choosing an 8-oz. cup of pumpkin spice latte rather than a 16-oz. cup will save 170 calories. Choosing a 12-oz. cup of pumpkin spice latte rather than a 16-oz. cup will save 80 calories. Avoiding whipped cream will save 70 calories. Choosing almond milk will save 80 calories. Choosing coconut milk will save 40 calories. Choosing non-fat milk will save 50 calories. Are Pumpkin Spice Lattes Diet Friendly? Is a pumpkin spice latte diet friendly? You can, in fact, enjoy a pumpkin spice latte no matter your diet preference. We have recipes for a vegan pumpkin spice latte and a keto pumpkin spice latte. A vegan pumpkin spice latte is very diet friendly, and is naturally sweetened and free from dairy. Below is a pumpkin spice latte vegan recipe that is good for two servings. It will take about five minutes to make this recipe. Combine non-dairy milk, pumpkin pie spice, espresso or coffee, maple syrup, vanilla extract, and pumpkin puree in a high-speed blender, and blend until smooth and foamy. This next recipe is perfect for the keto diet since it is high in fat and low on ingredients. The following is an easy-to-make keto pumpkin spice latte recipe you can try. Combine pumpkin pie spice, butter, and coffee in a deep bowl and use an immersion blender, or put the ingredients in a blender. Add the boiling water, and blend for 20 to 30 seconds until it becomes foamy. Pour the mixture into a cup, and garnish with pumpkin pie spice or cinnamon. Serve immediately. Nearly every restaurant is selling the pumpkin spice latte these days. But which pumpkin spice latte is best? Furthermore, should you be making your pumpkin spice latte at home instead? In this section, we will compare a homemade pumpkin spice latte with some of the more popular brand name pumpkin spice lattes you can purchase from your favorite restaurant, including Starbucks, McDonald’s, and Dunkin’ Donuts. We featured the Starbucks pumpkin spice latte earlier in this article to help you understand the nutritional content in an average store-bought pumpkin spice latte. Let’s recap the nutrition and ingredient information. A 12-oz. pumpkin spice latte with 2% milk and topped with whipped cream contains 300 calories, 11g of fat, 40 g of carbs, 11 g of protein, and 39 g of sugar. From an ingredient perspective, Starbucks uses some natural ingredients like pumpkin puree as well as common preservatives like potassium sorbate. A small 12-oz. pumpkin spice latte with whole milk from McDonald’s contains 270 calories, 9 g of fat, 41g of carbs, 10 g of protein, and 39 g of sugar. What about the Dunkin’ Donuts pumpkin spice latte? The small 16-oz. pumpkin spice latte drink with pumpkin swirl flavor, whole milk, and no additional sweetener contains 230 calories, 6 g of fat, 36 g of carbs, and 7 g of protein. From an ingredient perspective, the list includes brewed espresso coffee; milk; caramel-flavored swirl syrup with sweetened condensed non-fat milk, sugar, high-fructose corn syrup, brown sugar, water, caramel color, natural flavor, salt, and potassium sorbate; and pumpkin spice-flavored syrup with condensed skim milk, high-fructose corn syrup, sugar, brown sugar, caramel color, potassium sorbate, natural and artificial flavors, salt, disodium phosphate, and mono- and diglycerides. Your best bet is to go with a homemade pumpkin spice latte. In a homemade pumpkin spice latte, there are no perspectives and additives. The ingredients list can be simple and of your choosing; however, some healthy options include brewed coffee or espresso, pumpkin puree, vanilla extract, your choice of non-dairy milk like coconut milk or almond milk, maple syrup, and a homemade pumpkin pie spice that can include cinnamon, allspice, ginger, cloves, and nutmeg. A mug of homemade pumpkin spice latte contains 247 calories, 21g of fat, 0.5 g of fiber, 1.8 g of protein, 11.2 g of carbs, and 8.5 g of sugar. In other words, it contains less fat, sugar, calories, and carbs than the other choices in this section. There is also some fiber in there as well. Can a Pumpkin Spice Latte Give You a Stomachache? Are there any side effects of drinking a pumpkin spice latte? After drinking many of the brand name pumpkin spice lattes, some people may experience a stomachache, chills, and even diarrhea. A Starbucks, McDonald’s, or Dunkin’ Donuts pumpkin spice latte will often contain milk, and people intolerant or sensitive to dairy will also experience abdominal pain, bloating, nausea, diarrhea, and flatulence. The Starbucks pumpkin spice latte contains several ingredients that can trigger stomachaches. Some of these ingredients include the carrageenan in the whipping cream, the food dye color of annatto, and the preservative potassium sorbate from the vanilla syrup. Carrageenan leads to inflammation, and is linked to bloating, cramps, gas, ulcerative colitis, large bowel ulceration, colorectal cancer, liver cancer, and immune suppression. Potassium sorbate can cause allergies, and it can also be contaminated with hazardous chemicals like arsenic, lead, and mercury. Some people have also reported reactions to annatto, including symptoms of irritable bowel syndrome such as bloating, abdominal pain, and diarrhea. Some pumpkin spice toppings contain sulfiting agents, which are known to lead to abdominal pain, diarrhea, and anaphylactic and asthmatic reactions. It is not just about the calories, fat, and sugar content with a pumpkin spice latte. How do you avoid potassium sorbate, carrageenan, sulfiting agents, and other unsavory ingredients? Definitely go with a homemade pumpkin spice latte since you can choose natural ingredients with very few problems. The pumpkin spice latte is quite the trend, especially in the fall and around the holidays. But everyone wants to know what pumpkin spice latte is best! In this article, we guided you through everything you need to know about the pumpkin spice latte, including the taste, ingredients, nutritional value, calorie content, and the difference between a homemade pumpkin spice latte and a store-bought pumpkin spice latte from Starbucks, McDonald’s, and Dunkin’ Donuts. We also provided some homemade pumpkin spice latte recipes, including an iced pumpkin spice latte, a vegan pumpkin spice latte, and a keto pumpkin spice latte. In our opinion, the best and healthiest option is a homemade pumpkin spice latte. With this option, you can avoid added preservatives and potential side effects like stomachaches and bloating. Chaussee, J., “Starbucks’ Pumpkin Spice Latte is Back to Mess with Your Brain,” Wired, August 28, 2018; https://www.wired.com/story/starbucks-pumpkin-spice-latte-is-back-to-mess-with-your-brain/, last accessed October 10, 2018. Keuhl, K., “Does The Pumpkin Spice Latte Have Caffeine? It’s The Perfect Fall Pick-Me-Up For A Reason,” Bustle, September 9, 2015; https://www.bustle.com/articles/109367-does-the-pumpkin-spice-latte-have-caffeine-its-the-perfect-fall-pick-me-up-for-a-reason, last accessed October 10, 2018. “Pumpkin Spice Latte Recipe,” Dr. Axe; https://draxe.com/recipe/pumpkin-spice-latte-recipe/, last accessed October 10, 2018. “Pumpkin Spice Latte,” Starbucks; https://www.starbucks.com/menu/drinks/espresso/pumpkin-spice-latte#size=183886&milk=1306&whip=NA, last accessed October 10, 2018. Firkser, R., “Make a Better Pumpkin Spice Latte (and Save Yourself a Trip),” Greatist, October 6, 2016; https://greatist.com/eat/pumpkin-spice-latte-recipe-to-make-at-home, last accessed October 10, 2018. Flay, B., “Pumpkin Latte,” Food Network; https://www.foodnetwork.com/recipes/bobby-flay/pumpkin-latte-3162508, last accessed October 10, 2018. “Pumpkin Spice Latte Recipe 3 Ways – Regular, Iced, and Skinny,” Add a Pinch, Aug. 28, 2016; https://addapinch.com/pumpkin-spice-latte-recipe/” rel=”noopener” target=”_blank”>https://addapinch.com/pumpkin-spice-latte-recipe/, last accessed October 10, 2018. Sugar, J., “Save Hundreds of Calories When Ordering a Pumpkin Spice Latte by Doing This,” Pop Sugar, Aug. 28, 2018; https://www.popsugar.com/fitness/How-Make-Pumpkin-Spice-Latte-Healthier-Starbucks-43907157” rel=”noopener” target=”_blank”>https://www.popsugar.com/fitness/How-Make-Pumpkin-Spice-Latte-Healthier-Starbucks-43907157, last accessed October 10, 2018. “Vegan Pumpkin Spice Latte,” Detoxinista; https://detoxinista.com/healthier-pumpkin-spice-latte/, last accessed October 10, 2018. Aobadia, A., “Keto pumpkin spice latte,” Diet Doctor; https://www.dietdoctor.com/recipes/keto-pumpkin-spice-latte, last accessed October 10, 2018. Sass, C., “What to Know About Pumpkin Spice Lattes, From a Nutritionist Who Loves Them,” Health.com, Aug. 24, 2018; https://www.health.com/nutrition/starbucks-dunkin-donuts-mcdonalds-pumpkin-spice-latte-nutrition, last accessed October 10, 2018. “Hot Latte,” Dunkin Donuts; https://www.dunkindonuts.com/en/food-drinks/hot-drinks/latte, last accessed October 11, 2018. Stieg, C., “Here’s Why Pumpkin Spice Lattes Might Give You a Stomachache,” Refinery29, last updated August 29, 2018; https://www.refinery29.com/en-us/2018/08/208486/pumpkin-spice-latte-ingredients-nutrition-stomach-pain, last accessed October 11, 2018. Link, R., “Annatto: Is This Natural Food Dye Safe?” Dr. Axe, September 24, 2018; https://draxe.com/annatto/, last accessed October 11, 2018.